Charlotte is MD Insurance Product at buzzvault, a radical new insurtech proposition offering the world’s first truly intelligent, personalised home insurance based on a digital catalogue of consumers’ possessions stored on the blockchain. This offers fairer pricing and a fast, accurate claims process. Charlotte is an insurtech veteran who has been making change a reality in insurance for years. Previously part of the founding and exec team of insurethebox, she now thinks home insurance is overdue its own insurtech revolution. An actuary by training, Charlotte has a deep understanding of the trials and tribulations of the insurance industry. While working as an actuarial consultant to the general insurance industry I became fascinated with why insurance is so hard to change, as well as its power to support and influence society – and was keen to use that for greater societal benefit. So, in 2010, I joined a small band of fellow dreamers to make a new tech vision for insurance a reality. Insurethebox wrote “Saving Lives” on the wall and set out to build telematics products focused on safer driving for young people, while also using data to improve the claims process, save money and reduce fraud. Our success catalysed significant attitudinal shifts in the industry, and the company was majority-sold to a worldwide reinsurer in 2015 for a $140m valuation. I left in Summer 2017 to disrupt another part of insurance – this time the household market through buzzvault. One of buzzvault’s great USPs is buzzmove, a distribution channel which is already disrupting home removals using data-enabled superior services. The customer journey from buzzmove to buzzvault gives customers a record of what they own in under 15 minutes, so that they can insure whatever they want. Insurance is a great societal enabler, empowering people and business to expand and grow. So I’m passionate about producing insurance products and services that make it easier for us to live as we choose – connected insurance has some of the greatest potential to help here. In many insurtech teams, my experience is of two major flaws – too much tech and not enough insurance (resulting in a business model that won’t work in the insurance reality) or too much insurance and not enough tech (resulting in something that’s not really different from the status quo). That’s why it’s so important to get innovation within insurance right, including how to transition from imagination to reality. Ideas are like diamonds – without prospecting, mining, sorting, polishing, cutting and design they will never end up on your finger! I’m also – of course! – excited by the opportunities that blockchain brings. We have an energetic insurtech community with too many innovators to pick just a few names… I would, however, single out influencers from my own career that I have personally experienced driving the insurtech agenda. 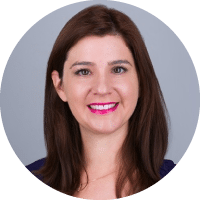 Becky Downing, the founder and CEO of buzzgroup, is a wonderful example having rapidly created a vibrant, revolutionary business from the ground up. Also, insurethebox founder Mike Brockman is a serial entrepreneur whose relentless pursuit of a better way resulted in a string of successes. OUTSIDE OF INSURTECH WHO ELSE INFLUENCES YOU? JK Rowling and Bill & Melinda Gates – I love successful people who use that success to improve the world around them. Diversity is also a key topic for me. Time Magazine made the women of the #metoo campaign their person of the year for 2017, and Melinda Gates recently wrote a fantastic article there supporting a new era for women. Lastly, I’m a mum to two fantastic school-age kids. I recommend anyone to try and explain to children what they’re doing. If you can’t – or if you fall down at their fifth “why” in a row – you don’t really understand it! They also have the most wonderful way of getting straight to the logical centre of a problem: shouldn’t it just be like this instead? I may be biased, but the launch of buzzvault is going to be big. Many insurtechs are coming to market and will be tested on the most important critic there is – the consumer. Blockchain becoming a reality in insurance, not least with buzzvault. After all the talk, it’s time to see who really understands the jargon. Sadly, global warming will be another key factor. With more and greater disaster events, we’ll need better, more personalised cover. Podcasts, webinars, whitepapers, speaking opportunities, product development, all the above as long as it’s engaging, insightful and helps us convey how we plan to empower consumers through their own data. Engaging with me on social media is probably the best way. It’s a real feed of ideas and opinion that lets busy people get the insurtech buzz in an instant. The other way to get in touch – and get more information about buzzvault – is via our website.